The Dixie Canyon PTA welcomes you and your child to our wonderful school community. Join us for Kindergarten and Transitional Kindergarten play dates. Your children will get the chance to play with their future classmates and visit the school while you get to know fellow parents. It’s a great welcome to our community! June 14 10am-Noon at Dixie & August 11 10am-Noon at Dixie. To help you prepare for this exciting transition, we have put together a quick “Dixie Canyon 101 overview”. There is an abundance of information available when you peruse this website. We encourage you to visit this site often to answer any questions. We look forward to your involvement with Dixie for years to come! Parents and their chidlren are instructed to gather promptly at 9AM in the Dixie Canyon Auditorium on the first day of instruction: Tuesday, August 14, 2018. On this day you do not need to bring a backpack, a snack or a lunch. The children sit together in front of the stage and parents at the chairs while an overview is presented. Once this is completed, parents follow the Teachers and their class to their classroom in the Kinder area. You will have an opportunity to see the classroom and listen to the teacher discuss what the kids can expect during the school year. This will be a short day for your child and you will take them home with you at 11AM. Wednesday, August 15th we will begin our normal school schedule. You will bring your child to the Kinder area to line up for class before 8:10am and they will be dismissed at 2:38pm. On August 15th they will need their backpack with lunch, snack and water bottle. See below for information about what to send to school with your child and what not to send. Also note the section on regular drop off and dismissal times. The school yard opens at 7:45AM daily. You are encouraged to arrive at the school early to have time with your child before the 8:10am bell. 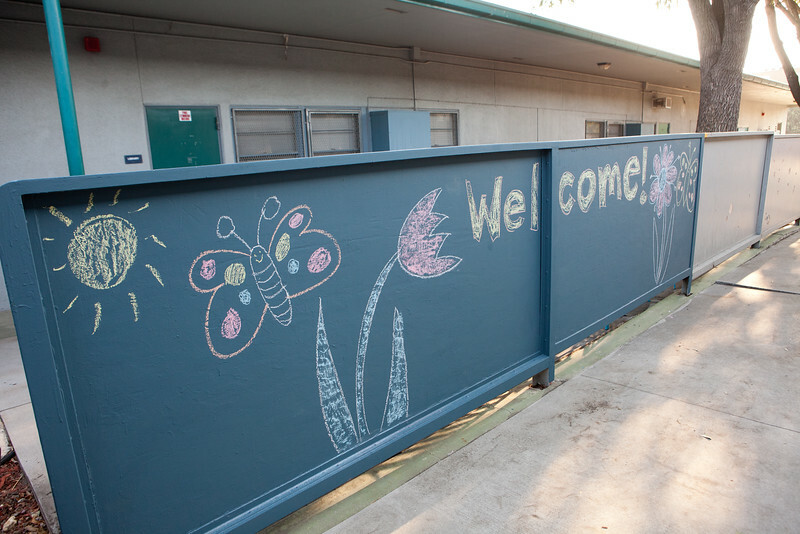 Kinder parents are required to walk their children to the kinder yard, where they have dedicated play space. There are no drop offs in front of school for Kindergartners. Many parents stay with their child until the bell, when kids line up by classroom with their teachers. Thereafter, parents are asked to leave school grounds quickly to avoid class disruption. If you remain or return to the school after the first bell, you must get a visitors pass from the front office. The school day ends at 2:38 on Mondays, Wednesdays, Thursdays and Fridays; and at 1:38 on Tuesdays. Please see the calendar for holidays, school breaks and minimum or shortened days. Minimum day dismissal is 1pm and Shortened days dismissal is 2pm unless otherwise noted. Parents/caregivers/guardians begin lining up outside of the school’s locked front gate as early as 30mins before the end of school day. The gate opens at the bell, when you will walk to your kinder classroom to collect your child. What does my Kindergartner need? A backpack: large enough to hold a homework folder, art projects, and other handouts. Closed-toe shoes and socks that they can run and play in. Nothing that could slip off, including crocs. Girls must wear shorts or “cartwheel shorts” under dresses or skirts. A lunchbox or sack lunch and snacks for recess. Please do not send your child to school with a hot fast food lunch. Please pack your snacks in a container designated just for snacks so that they can take just the snack out at snack time. You do NOT need school supplies. Please make sure all your child’s items are labeled. Children have a tendency to discard or forget their things throughout the school and many kids have similar clothes. Please check the Lost and Found,located in the school hallway regularly. Dixie Canyon offers breakfast and lunch for all its students. Each child will have their own account under their Student ID number to purchase food and drink at the cafeteria. You may create an account online and add money (via credit card or checking account). Alternatively, you may send your child to school with cash in an envelope with their name, class number and grade. They will hand this to the cafeteria workers who will create an account for them. Please make sure your Teacher is aware anytime your child is carrying cash. Click here for the Dixie Canyon menu. Dixie is proud to offer many extra-curricular activities. Information regarding these activities (including dates, times, and prices) are part of the Welcome Packets sent home in your child’s backpack. Please note that After school programs are not sponsored by the PTA. These programs are included in the packet for your convenience. If you need daily after-school care for your child, Dixie offers Extended Education programs through STAR Education. STAR also offers enrichment programs throughout the school year. Classes are 1 hour per week and include Ceramics, Cooking, Basketball, Dance, RockSTAR, Wildlife, Science,Woodworking and Chess! For more information about the specific programs and pricing, click here or stop by the on-campus STAR office. Principal Mrs. Yniguez sends out a weekly call message to parent every Sunday with information for the week and reminders that affect all students (and parents). Please be sure the office has the correct phone numbers and email addresses. Your Dixie PTA has prepared a Welcome Packet for all grade levels. Look for your packet in your child’s backpack the first week of school. The materials included provide a wealth of important information regarding schedules, safety, events and ways to access Dixie information. Sign up for eBlasts – the weekly email event notification. Any flyers requesting your response should be returned to the front office the first weeks of school. The Welcome Packet also includes a membership flyer encouraging you to join your PTA. Becoming a member will give you a voice in the community. Attend the PTA monthly meetings and learn how you can participate. The community at Dixie Canyon is diverse and welcoming. We hope you enjoy your experience and we understand that you will have questions. The PTA board members are available on campus most mornings after drop off. We are happy to answer questions and help you.